Pat Mustard's lovechild wrote: is it just me that the go to/jump to page doesn't work for? 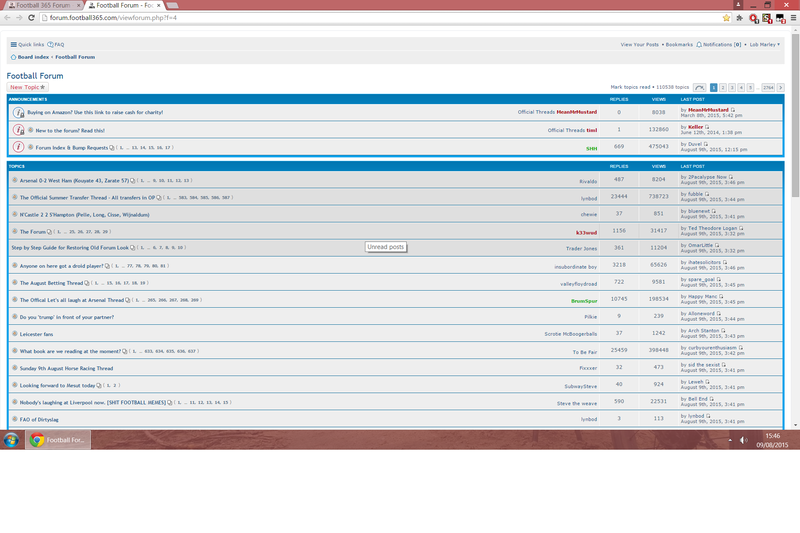 I have quite a large monitor, and because of such the forum appears a vertical strip in the middle of the screen. Can someone assist me in tweaking whatever needs tweaking to make it fill the screen? I've done everything in the OP and mine looks nothing like that. 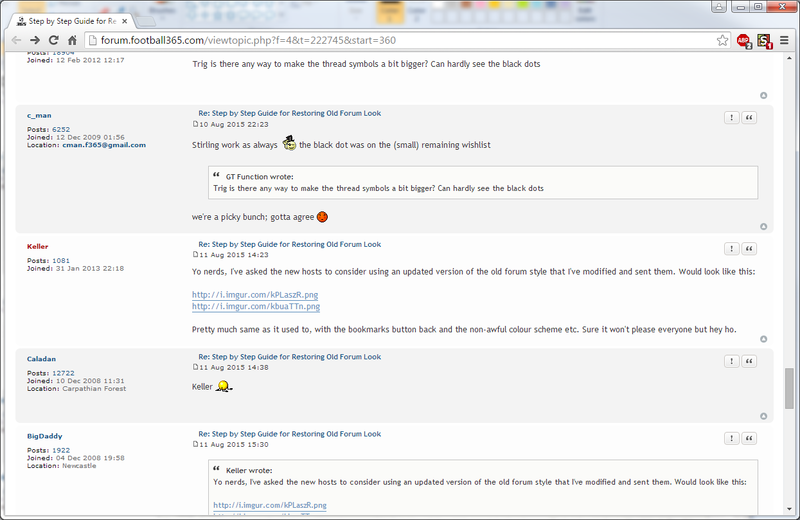 OmarLittle wrote: I have quite a large monitor, and because of such the forum appears a vertical strip in the middle of the screen. Can someone assist me in tweaking whatever needs tweaking to make it fill the screen? I'm happy now that things are looking more refined & I have the bookmarks tab back. Nice work. Lob Marley wrote: I've done everything in the OP and mine looks nothing like that. I think it's a big deal that you don't get icons for threads you've posted in. Been at a festival all weekend, will take a look at what can be done about the "threads ive posted in" sort of icon. Would something like this be better? Edit: Actually just noticed, but if there are no unread posts in a thread the bell icon completely disappears and therefore so does the dot telling you you've posted in the thread. Any way round that? Is there a newer code somewhere? You'll need to update using stylish. Click on the Stylish icon in your top bar, click "find all styles for this site"
When you are there, click on the top version, then click "update with stylish"
Be sure if you've made any custom changes to copy these out ready to past back into the new version once you have updated. Location: Riding a two-headed sexbeast. Just installed this, on my home machine. Will stick it on my work machine tomorrow. Pretty much same as it used to, with the bookmarks button back and the non-awful colour scheme etc. Sure it won't please everyone but hey ho. I guess its a start, hopefully they will get it sorted. Would be good to have the edit/quote buttons etc.. back at the bottom of posts amongst other things. Apologies if this has been asked but whilst I like the new forum look, a lot of images don't load when I am viewing threads on iPad. I just get a little box with the word 'image' inside it. Anyone got any ideas how I can fix this? & can the admins make this the forum as default? Does this guide work on mobile or just desktop? If you want to add the black dots in, add this code in your code area. Ive added it toward the very bottom, but within the last /**** END OF BELLS BACK ****/ bit. Does anyone know how to make the font bigger for the main page, as in all the thread titles? Sharpey wrote: Does anyone know how to make the font bigger for the main page, as in all the thread titles? Move your face closer to the screen. If the font appears too big, move your face back a little. I added this and it didn't work. I am being dumb but where do i add it?